Another Sunday breakfast, another foray into the unknown. What has happened to us? We have become intrepid. 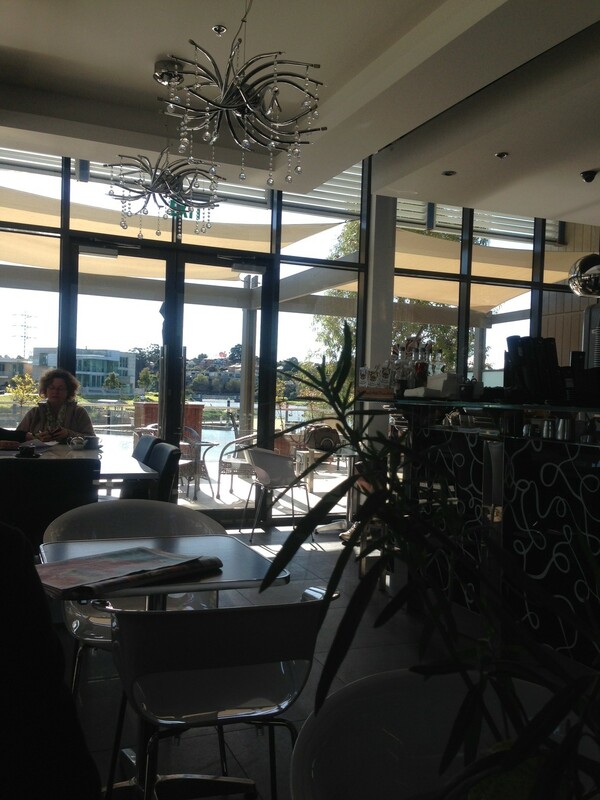 This weekend saw us staying close to home and to the water, with a visit to Cafe Boutique down in Edgewater. It’s a hidden-away little gem of a place with lovely views across the Maribyrnong River: lovely in winter but sure to be a hit in summer too, with a nice big verandah offering front-row river views. One gripe of mine that applies to many Melbourne restaurants and cafes: Cafe Boutique seems to ignore the fact that Melbourne has a moderate oceanic climate, not a sub-tropical one. This involves cool winters, people. It is staggering to me to find myself so frequently in eateries with no heating and doors or windows wide open in winter, creating icy wind-tunnels that chill both the diners and the food in no time flat. Sadly, Cafe Boutique is one such place, with a front door wedged open on one of the coldest days of the year, and the verandah door being used as a thoroughfare. I kept my overcoat on for the whole visit. That said, the food was pretty good. We ordered our usual breakfasts: poached eggs with mushrooms and roasted tomato for me, poached eggs with smoked salmon and bacon for him. The food arrived in record time (indeed, before my tea could be cobbled together) and the portions were plentiful if a tiny bit greasy. I could have done with a second slice of sourdough but Orlando was happy not to be tempted. Next time I shall ask for a second slice. The other tiny thing that marred our visit was the interaction of the staff with each other. We felt we had stumbled upon a bit of a toxic work environment. Staff members tended to speak to each other in raised voices, and many of the conversations were less than friendly. It was as if they hadn’t realised the customers could see and hear them bickering. We weren’t sure if it was just a pretty bad day for whatever reason, but both of us were left with the impression that this was business as usual for the cafe. Not a completely relaxing vibe. The rest of the menu looked interesting enough, and a handful of specials on the blackboard also suggested a second visit might be warranted. Not to mention the counter full of lovely cakes and pastries, from macarons to tiny bite-sized friands, from chocolate cheesecake to generously sized individual lemon meringue pies. 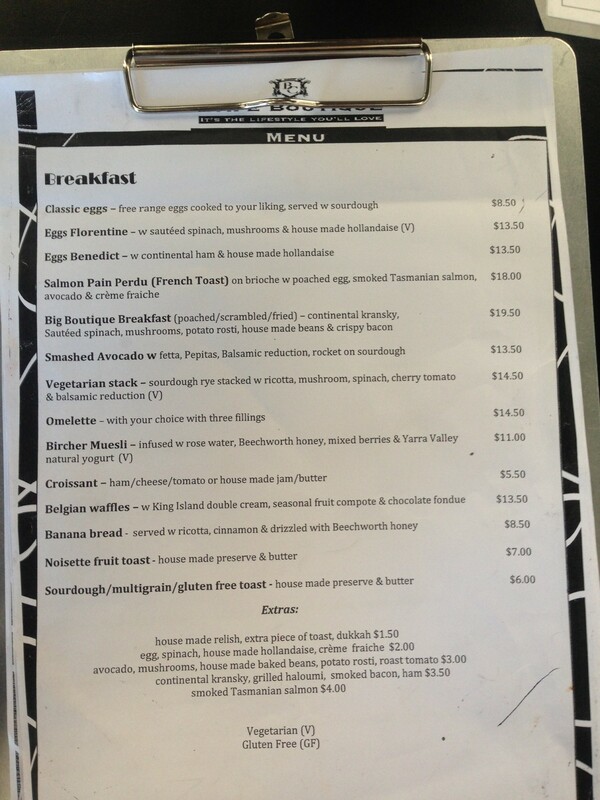 Total price $41 for two substantial breakfasts and two pots of tea. I could see this place becoming a regular haunt when working from home, if they can manage to sort out the ambient temperature and the general air of staff irritation. Cafe le Chien has been a regular breakfast haunt for us since arriving here in 2005. Our routine is to head down there around 1pm on Sundays when most of the families have headed off. 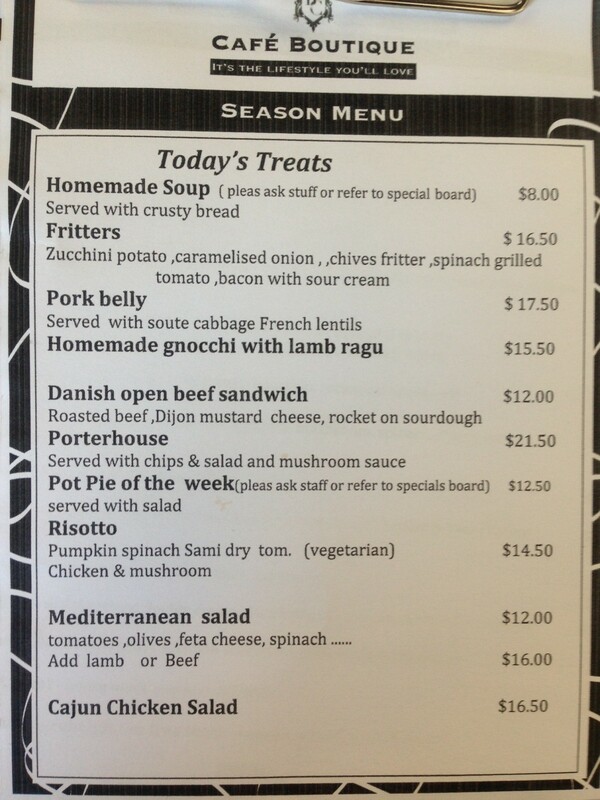 We have the same thing every week and the staff know we won’t need menus. The good things about Cafe le Chien are plenty: good music at weekends. Decent chilli eggs. Friendly service (although I have read a few other blogs that say you don’t get good service unless you are a known regular). The eggs were always a highlight – you simply can’t get better scrambled eggs in this town. The teapots are nice and big and the tea comes exactly the way you order it (you have no idea how rare this is in Melbourne where most places are geared to finicky coffee heads). You will almost always get a table. And the evening meals are worth a visit too. Over the years though, I’d say the only thing we can complain about are portion sizes. Prices have gone up a very modest amount over the seven or years we’ve been coming here, but certainly over the past two years some of the portion sizes have come down. My partner’s usual breakfast involves smoked salmon, which has gone from a pretty generous portion to a really tiny amount in a small Chinese sauce bowl. It irritates now, every time we are served. Other sides that have suffered include the mushrooms and other vegetarian items. Nonetheless, we still visit almost every Sunday when we are in town, and to us it’s still the place to beat. Let’s shake things up, I’d say. Let’s find somewhere else to have Sunday breakfast, I’d say. Then, time and time again: it’s too hard, I’d say, and we’d head back to Cafe le Chien as usual. Then one week we actually did it – we found a new place and tried it. Fifty-Six Threads is a lovely little place on the ground floor of a block of commission flats at the back of Kensington, just a couple of minutes from the main drag. It was set up by AMES to provide employment and training opportunities for new local migrants. The wood-panelled interior looked inviting enough, and we found a seat easily enough at just past one o’clock on a wintery Sunday afternoon. The menu isn’t huge, but there’s plenty to choose from on the all-day breakfast menu, and a regularly changing list of specials. We both opted for a breakfast dish. The 56 Threads Breakfast was a generous platter of all those breakfast favourites: pork and fennel sausage, bacon, eggs how you like them, garlic mushrooms, spinach and a little pot of onion jam all served on sourdough. Orlando would have preferred a less fancy sausage but he cleaned his plate nonetheless. Three eggs were ordered and two arrived with a pre-emptive apology and a fourth egg offered to make up for the mix-up – nice. My Green Eggs were delicious: poached eggs (you can choose scrambled or fried) on sourdough with green pesto, plenty of avocado, spinach and a handful of garlic mushrooms. Tea was served in small enough pots but refills of water were provided quickly and with a smile. The cake stand had tiny and large muffins as well as other slices and delights to tempt as you pay your bill. Coffee is supplied by the Social Roasting Company – another social enterprise – and whilst we didn’t try it, the steady takeaway traffic seemed to indicate its quality. Just under $40 for a substantial breakfast for two: not much cheaper than our usual haunt, plenty of delicious food and the added bonus of knowing your money is going towards something genuinely useful in the neighbourhood. 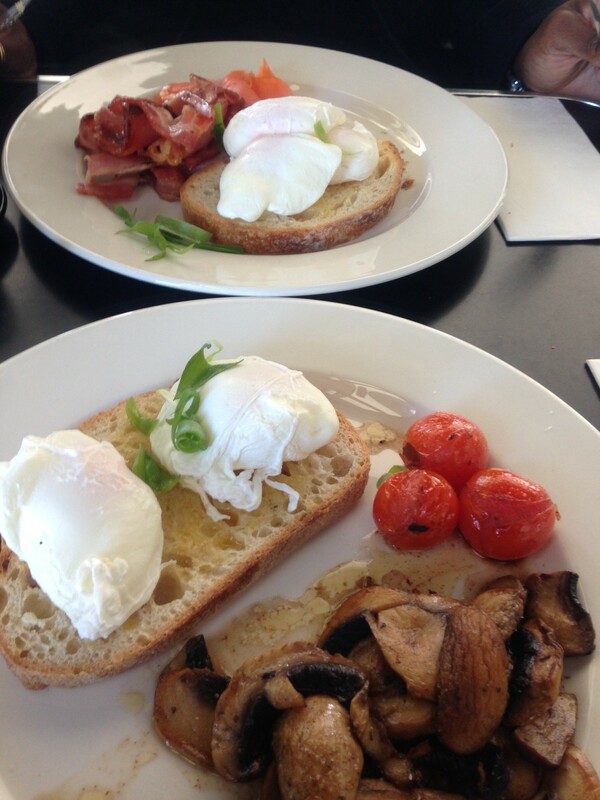 A very lazy start to ANZAC Day meant we were too late to order at our original (usual) brunch venue. Around the corner, we saw that Touk’s has made way for Chicco, so it was a good time to give it a try. The place has certainly been given a facelift since Touk days, with clever glass bowls suspended from hanging-basket holders in place of lampshades, and chairs and cushions covered with the rough hessian of a coffee bean sack. We sat at the window and surmised that at least some of the staff had survived the name change: there were certainly one or two familiar faces still. 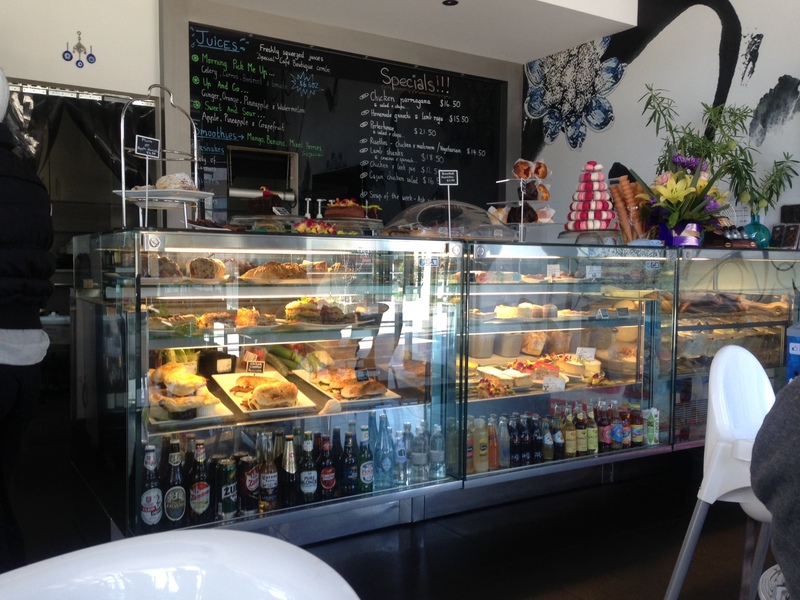 Jellybread used to be a tiny little cafe in West Footscray that served really good coffee and a tiny bread-based menu. 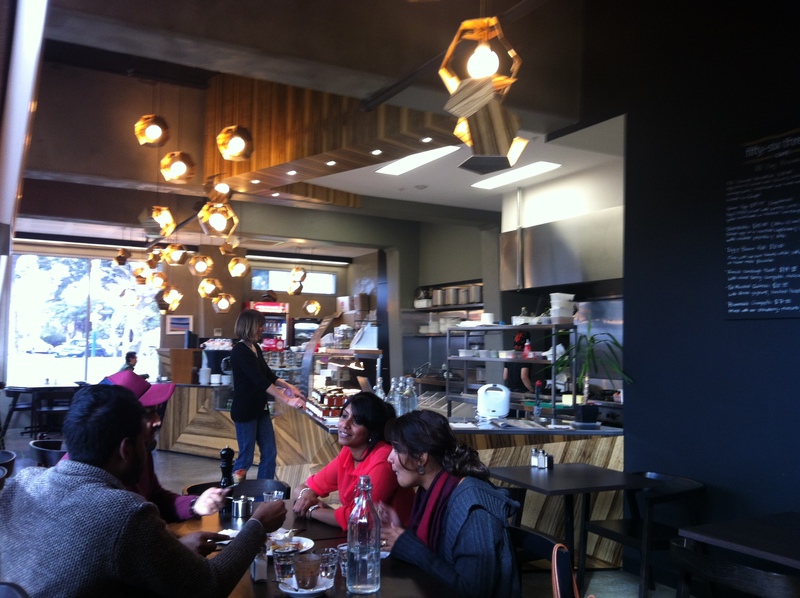 It had three or four tables inside and two or three outside on the Barkly Street pavement. I never could figure out how the young couple made a living out of this little place. A few months ago, they extended into the old chemist shop next door, and made the back yard part of the cafe too. The old chemist part still has some of the old shelving which is littered with out-of-date Encyclopaedia Britannicas, vintage mags for the grown-ups and plenty of children’s books for the little ones. Unashamedly child-friendly, this place is run by young parents and it shows. That’s not to say that the food isn’t good, the coffee isn’t well-brewed and it’s not for a grown-ups-only table. I recently spent a long lunchtime down there, generous helping of avocado, tomatoes and feta on sourdough toast and a nice pot of tea, laptop on the go as I downloaded the contents of my brain into a detailed operational procedure. It was a quiet day and I felt no need to rush, no distraction from little ones. Instead I spread out across a big old kitchen table, listened to some rare funk tunes on the old-school turntable and had a most productive hour or two. The menu is simple and mostly bread-based: things on bread or between two pieces of bread. Fillings and options are simple. The hot drinks list is also short but the coffee is pretty damn good and they know how to serve a good pot of tea. My grapevine tells me the backyard space “JellyBread Park” is a favourite amongst coffee-morning mums’ groups and their offspring. That might be a deterrent for me, but as a weekday morning coffee or lunchtime haunt, it’s firmly on my shortlist. Footscray will always be… well… Footscray. But West Footscray (or WeFo as we insiders call it) is up-and-coming. On-the-edge. An Emerging Destination. Oh yes, West Footscray is the new Yarraville, people. When we moved here six years ago, West Footscray was still pretty basic. The high street had an average local independent supermarket, an old Croatian/Italian/Whatever social club, a local library and a dwindling number of shops: pharmacy, greengrocer’s, school uniform shop, charity store. Soon after, it started turning into Little India and a fair number of Indian grocery and clothing stores sprung up. Then the Indian restaurants started multiplying. Now we have a decent little shopping street with really good Indian groceries, a couple of good greengrocers, and one or two really good restaurants with a good following. The only thing we were really missing was somewhere to go for breakfast. Then Gusto at Barkly opened, with decent pizza in the evenings and a pretty good breakfast menu (just too many pushchairs for my comfort levels). Jellybread bought the shop next door and expanded but their menu remained limited. And then a few weeks ago, Besito opened. Owned by a young Colombian couple, Shan and Andres, it is a small, colourful cafe serving the best Colombian flavours and pretty decent coffee. They are not open in the evenings (yet) but they do a pretty good breakfast/all day menu which nicely covers breakfast, lunch and sweet things to go with coffee. Side orders can be ordered together to augment a simple dish of eggs or arepa, a white corn bread visually reminiscent of rice cakes. The side orders are generous portions: chorizo is a full sausage, scored to help with even cooking, and well-seared on a hot plate or barbeque. The in-house hangover cure is changua – eggs poached in coriander-infused milk. Mild and seriously hot chilli sauces are within reach for another blast of South American flavour. Most things are made from scratch in-house including the pastries and desserts: the lady of the couple who own this place is a pastry chef and it shows. Orlando showed an interest in some shot glasses in the chill cabinet one morning: we were immediately given one on the house with two spoons. A creamy, not-too-sweet caramel base was covered in the best chocolate ganache, giving just the perfect blast of sweetness without being overpowering. A question from me about gluten-free options on the menu resulted in a clear and concise overview of what was gluten-free and what was not, reassuring me quickly that they knew the provenance of all their food and made sure all their staff did. Most menu items, for the record, were either gluten-free or could be served as such if requested. They tell us they will be open soon in the evening, serving South American street food which goes down perfectly with a beer or a glass of wine. I can tell you now this place will become a regular haunt. The owners and their staff are friendly and knowledgeable, it’s a lovely relaxing place to eat, the menu is a knock-out and it can only get better as word spreads. No free wi-fi yet, but we will keep working on them…..